I'm still working with the Bee Pen Sketcher's sketchbook, as we'll be using it for the Art in Action workshop I'm leading in a few months. 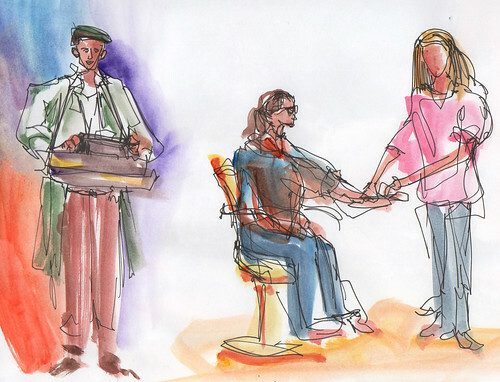 At a conference for work in Anaheim, California, I sketched some entertainers: a poet with a typewriter slung around his neck and a temporary tattoo artist. I colored it with the inexpensive Yarka semi-moist watercolors and Pentel Aquash waterbrush that we'll be using in the workshop. 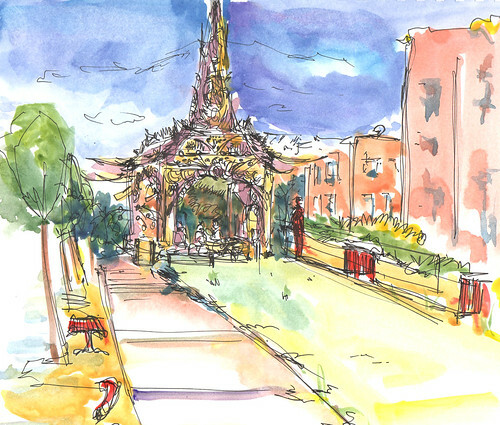 Last weekend, I went to San Francisco and sketched David Best's temple in Hayes Valley. Again, I used the Yarka watercolors. I like the colors you have. Somewhere I have a set of Yarka's from eons ago. Nice sketches. Super detail on the temple.